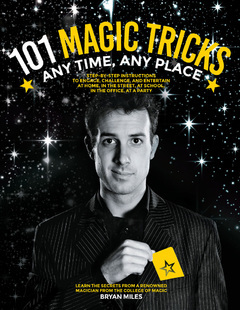 Bryan Miles will make sure you’re the life of the party with his 101 Magic Tricks: Any Time. Any Place. Entertain wherever you go with these clever tricks and learn the secrets behind the magician’s trade. Here’s a clever ruse you can perform in just about any fast food restaurant called the obedient ketchup packet. Here’s a step-by-step guide to fooling those around you with this fun magic trick. A ketchup packed obeys your commands by rising and lowering inside a bottle of water. 1. Remove the label from the plastic bottle and fill the bottle with water. Leave a small gap at the top. 2. Insert the packet into the bottle and screw the lid on. 3. The left hand holds the bottle at the base between the left thumb and fingers. By applying gentle squeezing pressure the packet will be forced to float downward. By releasing pressure, the packet will float upward. 1. Use the right hand to display the bottle to the audience. Place the bottle on the table and grip the base between the right thumb and fingers. 2. Make a magical gesture with the left hand as if hypnotizing the packet. Command the packet to float downward. 4. To finish, you can unscrew the lid of the bottle and remove the packet for inspection. Take It Further: What about combining this effect with another effect, such as a card revelation? You could print with a permanent marker on the bottle the words “Yes” and “No.” Now you can use the bottle to communicate when finding a selected card. Learn 101 simple magic tricks to astonish and amaze!